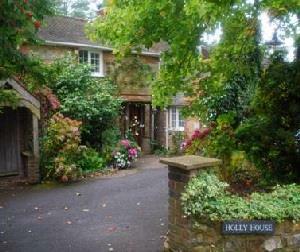 Holly House01825 740484work01825 740172fax Guest HouseHolly House, an early Victorian Forest farmhouse, now a comfortable family home, offers a warm welcome with an inviting lounge, comfortable beds & memorable breakfasts, served in the conservatory overlooking the one acre garden. Rooms have tea, coffee and drinking chocolate making facilities and colour TV. Holly House, an early Victorian Forest farmhouse, now a comfortable family home, offers a warm welcome with an inviting lounge, comfortable beds & memorable breakfasts, served in the conservatory overlooking the one acre garden. Rooms have tea, coffee and drinking chocolate making facilities and colour TV. From Haywards Heath take A272 towards Uckfield. At North Chailey pick up A275 and just after sign for Chelwood Gate turn right into Sandy Lane. At end of Sandy Lane turn righ. Holly House is just 0.5 mile down road on right hand side.